1. 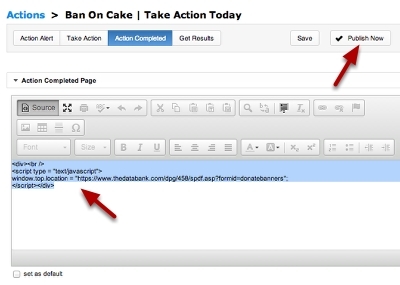 Go to the Action Completed step for your Advocacy Issue and then click on the Source icon to see the html view. 2. Copy the URL to the page you would like to redirect to, i.e. a donation page, tell a friend, etc. Note: Technically, your activist is being directed to a completely different form. Because of that, they will be asked to verify their identity. To ensure that your activist does not need to click the "Is this you?" identity validation when reaching the donation page, be sure to include the &ckmem=T text after the URL of the form, but before the closing quotation marks. 4. 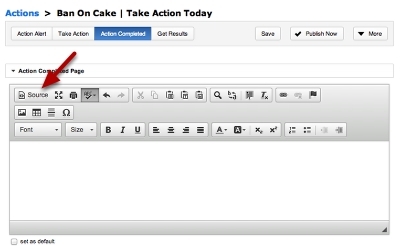 Paste code into the Action Completed page and click 'Publish Now'. 5. Your page will now redirect to the new page!